Each day the front desk is responsible for making sure all programs are pulled and placed on the wall filing cabinet in preparation for that day's training. This is probably the most important task of the front desk and should be done with the highest attention to detail. There are two things that are critical when pulling programs. Make sure each athlete's program is pulled. if #2 above happens please follow the written steps below or follow the instructions in the video. Look in the filing cabinet by the front desk to pull the programs of clients that are scheduled to come in on the current day. The filing cabinet is organized by first name. If you see a program is filled through week four and does not have a new program attached to it or in their folder, there is a good chance that this athlete needs a new program but forgot to sign up for it. See example below of a program that is completed. 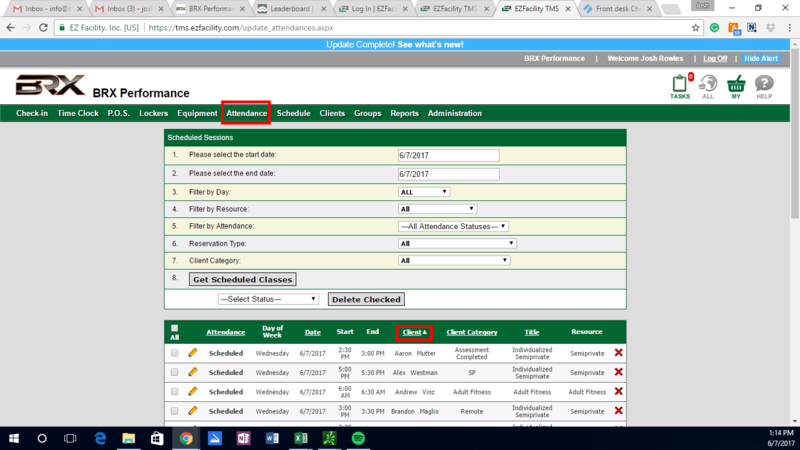 If you see that a program is completed (like the one above) and there is not a new program attached to it, immediately notify a BRX staff member. If this happens, check Dropbox to see if the athlete's next month's program is uploaded. In the example above, they would need Month 7, because they had just finished Month 6. If it is in their folder, then you can print the program and staple it to that athlete's previous program or put it in their folder. For instructions on printing, please follow the printing programs and throwing calendars protocol, which is the next step of this checklist. If their new program is not uploaded to Dropbox, message the BRX Performance specialist who is assigned to this athlete via Google Hangouts and report all missing programs to an appropriate BRX Performance Specialist BEFORE the day begins. NOTE: The frequency at which an athlete trains at BRX will influence when a program is completed. 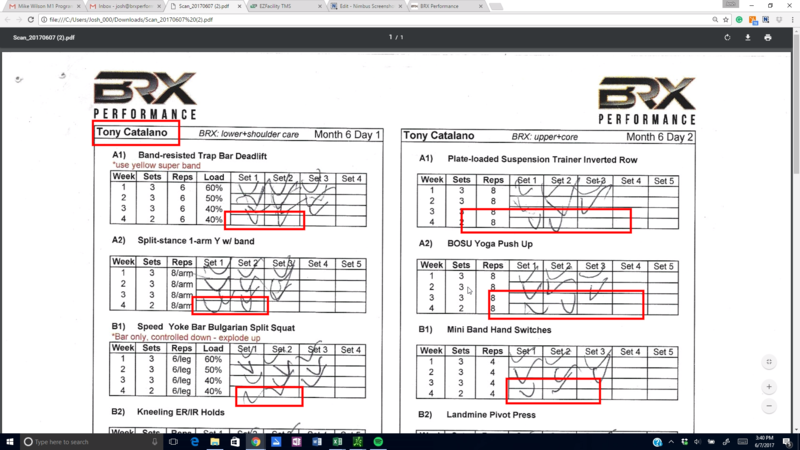 For example, if an athlete trains at BRX 2x/week, the entire back side (days 3 and 4) of their program could be blank but they will still need a new program. If an athlete trains 3x/week at BRX, all four weeks of Day 3 (on the back side of the program) would need to be filled in, and the same applies for 4x/week.